According to a recent Swedish review by Mia Romare & Lisbeth Dahllöf (2017), the production of 1 kWh capacity of lithium-ion battery causes emissions between 150 and 200 kg CO2eq/kWh (CO2-equivalent per kWh battery capacity). Calculating with 175 kg, just the batteries of a 100 kWh capacity Tesla Model S account for 17.5 t CO2eq. The footprint of batteries increases almost linearly with capacity since most effort goes into the production of individual battery cells and not into their aggregation. This is already quite a large amount for the battery alone. At 2.31 kg CO2eq per liter petrol/gasoline, the climate footprint of such an e-car battery is the equivalent of 7575 L fuel – enough to drive a conventional car for more than 100 000 km. Given the large footprint impact of battery capacity, it is clear that life-cycle assessments strongly depend on the total expected range of a car. It is interesting to note, that the 2015 Union of Concerned Scientist study, which concludes that the life-cycle assessment compared with a conventional car is positive, assumes a lifetime range of 288 073 km (179 000 miles) for the Tesla S. This range is reasonable for commercially driven cars but how about a privately owned commute car? It is reasonable to assume that most users would like to have a reasonable reserve for unforeseen events as well as reduced battery capacity (wear, temperatures) of one-third and can only charge the batteries at home. Of the official range of 460 km (285 miles), a well matching commute would be at a distance of 150 km (300 km daily range). Such a car could reach the lifetime range assumed in the model in about 3.2 years (assuming shorter trips on weekends and one holiday/yr), confirming the life-cycle assumptions of the 2015 study as reasonable. There is a catch, however. If the battery capacity and range of the car is a poor match, the assessment quickly becomes unfavorable. If, for example, the car is used only for a daily commute of 50 km and the longer range bought only for the holidays (estimated here at 3000 km/year), it would take about 17 years to reach the estimated lifetime range, more than the average life-expectancy of a car (e.g. 12 years). Carbon footprints of complex manufacturing processes are notoriously difficult to calculate and the scientific estimates may legitimately differ. 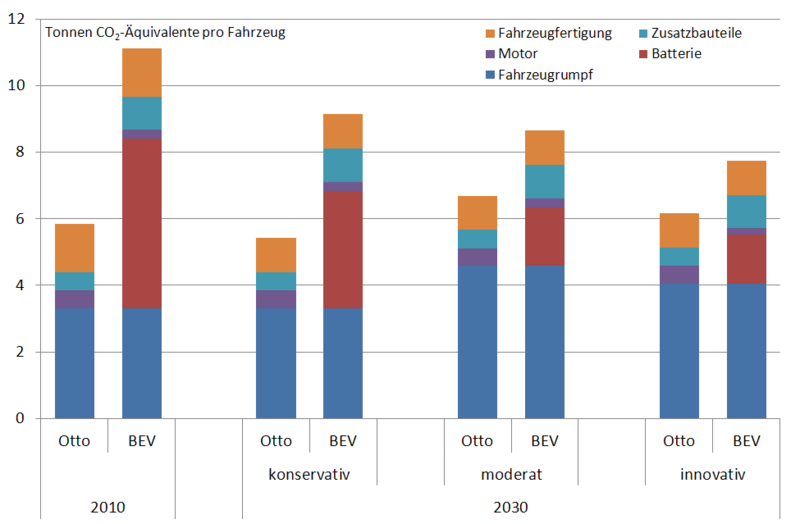 The manufacturing footprint of both conventional and electric cars is large compared to its usage footprint. The manufacturing footprint of electric car batteries is very significant and depends highly on the battery capacity. Battery capacity and resulting range for e-cars should not primarily be discussed in terms of a range-weight-price trade-off. It is a sustainability trade-off. A hypothetical Tesla S, with a 125 kWh battery capacity and ca. 676 km range would already have the carbon footprint of two conventional cars. Whether the added footprint of a battery pays off in an electric car depends on the relation between battery size and lifetime range. To achieve a positive ecological footprint, it is essential to buy an electric car with battery capacity matching the expected range as closely as possible. Which makes it difficult to use the car for a holiday trip…. Which leads me to the conclusion, that electric cars need smarter solutions. They don’t simply replace the current wasteful all-purpose-everything-I-might-ever-need fossil fuel car. Smart solutions are already available. Electric cars are a great component in an integrated mobility system that includes public transport, e-bikes, car sharing, and on-demand car rental (with options to use different models for different purposes like commuting, transporting your new furniture, or a long holiday trip). Next Retrofitting fossil-fuel-based water and space heating with heat-pump systems – a climate change priority or just not feasible?